Walmart sells the 2 oz. Glidden Paint sample for $2.94. 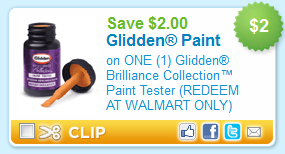 Use the $2.00/1 Glidden Paint Brilliance Collection Paint Tester coupon here to get it for only $0.94. This is perfect for a small painting project or to just pick up a sample for a larger project.